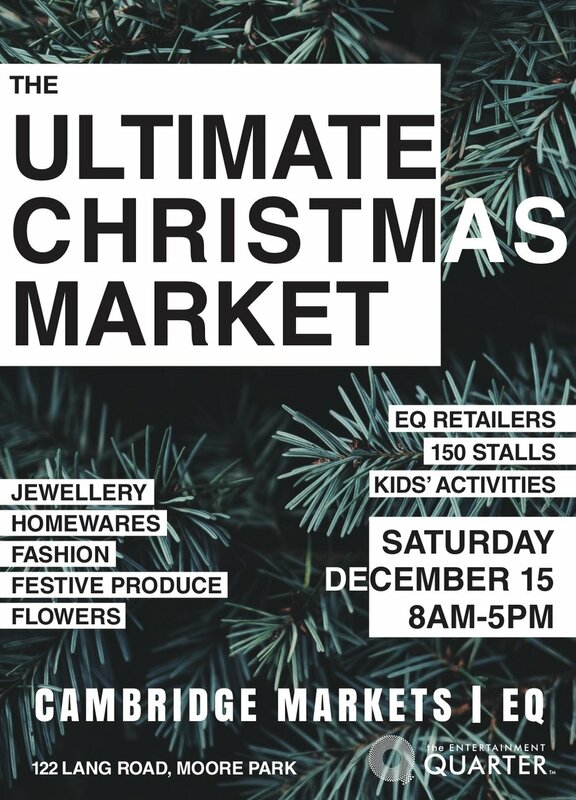 Exciting times as we count down to our wonderful EQ Christmas Market to be held on Saturday December 15. We are so looking forward to welcoming our 150 stalls and the excellent EQ retailers who will be a part of the market. The EQ Christmas Market is now one of the largest occasional markets in Australia, and will have an astonishing range of products on offer. There will be everything from homewares, art, jewellery, women’s fashion, men’s fashion, childrensware, toys, candles, hats, eyewear, stationery and a bounty of Christmas goods, from from Christmas trees and wreaths to hams, turkeys, cheese, vegetables and fruit, festive nuts, puddings and cakes, seafood and sweets. There will also be hot gourmet food stalls, a pop-up bar from the Urban Winery, desserts from Black Star Pastry, live music, entertainment for kids, a visit from Santa, reindeer and even some “snow”. We are very much looking forward to what promises to be an outstanding day full of festive cheer, top shopping and fun. This is an all-weather event and will run all day from 9am-5pm. There’s free parking for two hours! Please come along and be a part of the festivities. We are very pleased to be moving into summer, a great time for visiting markets. We are seeing a bounty of new season’s fruit and vegetables including the first of the stone fruit. We already have some lovely apricots and nectarines coming in from our farmers in Coffs Harbour, brought to us by our marketeer Michael Fanning from Banana Bar. Don’t forget to pay him a visit next time you are at the market. Andreas Rost grew up on a farm in his native Germany watching his grandmother baking bread. So when it came to choosing a living for himself, becoming a baker seemed a natural choice. In 2001, Andreas opened Organic Bread Bar on South Dowling Street, Paddington, and rapidly developed such a loyal following with customers that he opened a second outlet on Liverpool Street, Darlinghurst. He also operates each Wednesday and Saturday at Cambridge Markets EQ — the only market at which he sells his exquisite range of sourdoughs, speciality breads, croissants, European pastries and cakes. Andreas says Australians are increasingly buying and appreciating better-quality breads. “In Australia people appreciate good bread and they are prepared to pay a little extra for it,” he says. Congratulations to Evie, one of the lovely staff from Prickle Hill Farm who has had a baby girl called Amber. Great news. Well done to the team from Jimmy Liks who have launched their wonderful Mrs Liks take-home dinner range. Swing by the markets on a Wednesday to grab some of the packs which include meatballs, bolognese, vegetable ragout, green chicken curry and roti. We have a bounty of beautiful flowers coming into season. Come by for seasonal peonies, roses, stock and natives that are gorgeous at this time of year. Welcome to our new vegan store, Coco’s Coffee. These guys are offering outstanding meat-free, cruelty-free foods. Try their incredible iced beetroot latte or their iced charcoal latte, or a vegan hamburger — they taste great and are good for you. Congratulations to Mrs Fuh who has opened a new restaurant in Darlinghurst called Mama Fuh. The venue will offer all her classic pho options and more. 336 Victoria St, Darlinghurst.